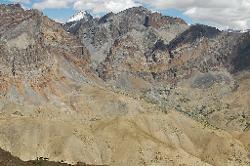 Map of our route from Ladakh to Zanskar and back; starting in Panjila then going via Singe La and Nyerak to Zangla. In Zangla we head north again via the Hanumil La to Lingshed; and return to Lamayuru via Panjila. 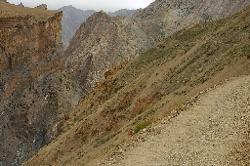 We actually planned a slightly different route back; but heavy rain made the Shilla gorge a little dangerous. 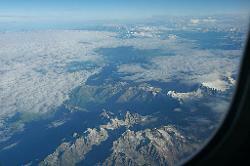 Flying from Delhi to Leh. 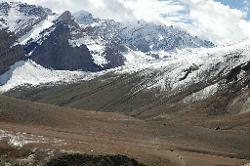 The Indian plain ends abruptly at the foothills; and the first Himalayan peaks appear. 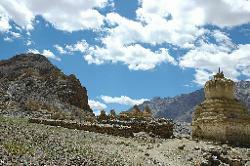 Numerous monastery can be found near Leh; Thikse is one of the most impressive and stands on a hilll above the Indus valley. 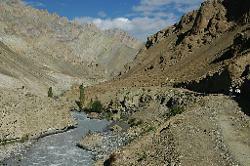 In the eastern part of the Indus valley another monastery overlooks the fertile valley; Chemrey. 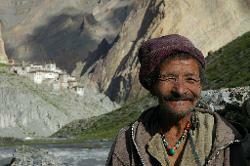 The courtyard of the new monastery at Taktok is filled with people. 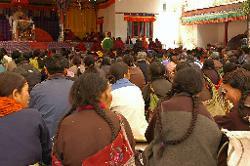 An important lama from Simla arrived; people have gathered to listen to his speech. 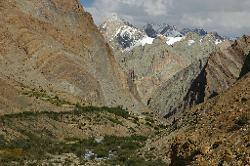 Stagnak; the tiger's monastery; rising above the Indus river. 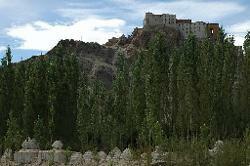 Further to the west lies Basgo; a former capital whose fort and monastery are built high above the village and its fields. 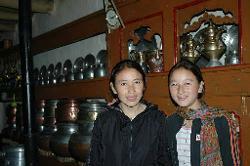 Homestay family in Basgo where I spend two very enjoyable days. 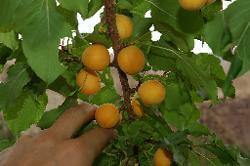 Most fruit is brought in from Srinagar; an exception are apricots which grow everywere in western Ladakh and taste delicious right off the tree. 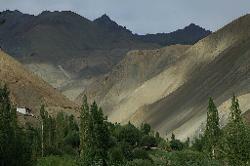 View over the green valley from the large monastery near the fort. 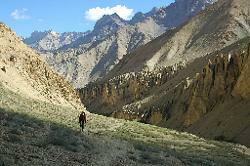 The start of our trek in Panjila from where we look into the valley which we will enter tomorrow on the way to Honupatta. 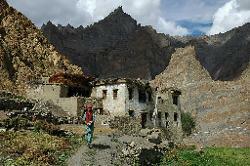 The monastery of Panjila is built at the end of the village; sadly its interior does not match its scenic location. 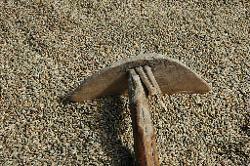 People are harvesting the barley until late afternoon. 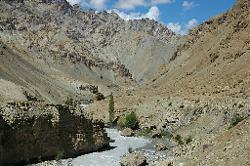 It is hard to imagine a better first day of trekking; looking back to Panjila as we walk along the river. 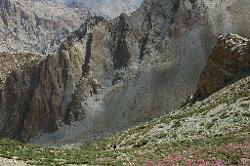 The valley gets more narrow; and soon turns into a gorge. 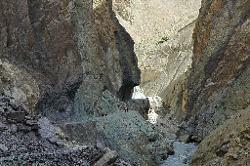 Trails are often chiselled out of steep rock faces; with the river raging straight below. 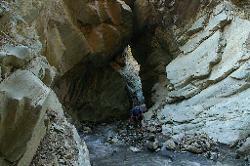 Climbing higher in the colourful gorge. 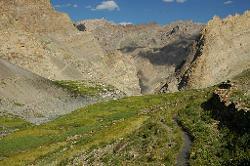 After some time in the narrow valley; it suddenly opens up; the trail flattens out and signs of habitation appear. 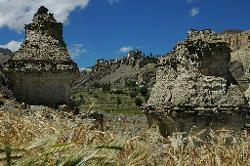 The village of Honupatta lies above the river and the barley fields. 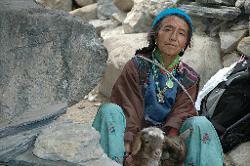 People survive thanks to their fields and animals; the young goats are taken very good care of. 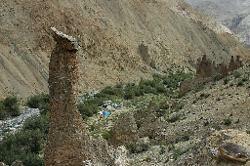 We camp some minutes outside of the village and enjoy the views down the valley where we came from. 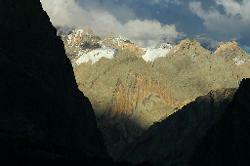 The setting sun illuminates the canyons. 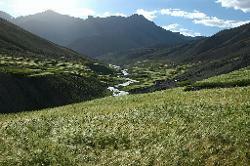 View of our camp near the river above Hanupatta. 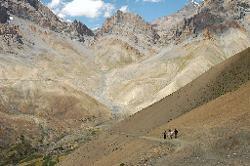 We climb up a steep sidevalley for views and acclimatization. 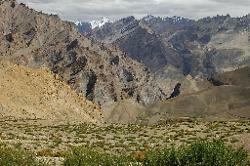 The higher we get the more colourful the valley becomes. 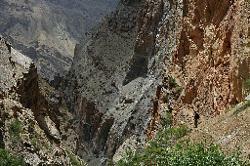 The scenery is overwhelming; not only the large spaces but also the small details. 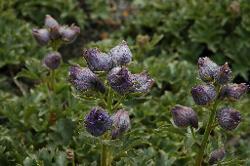 Flowers protect themselves against the cold temperatures. On the third day we face the first official pass. 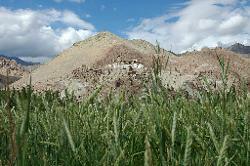 Sirsir La lies hidden left of the triangular hill at the end of the valley. 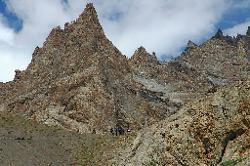 On the way to Sirsir La we see the jagged rocks at the entrance of Shilla gorge; our planned route for the way back. 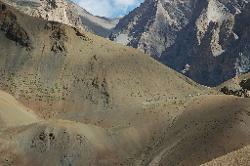 We leave the fertile valley below us and climb the last meters to the first pass; many more will follow in the next two weeks. Our horse caravan on the way to Photoskar. 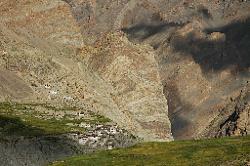 Mani wall and chorten before descending into the fertile valley of Photoskar. 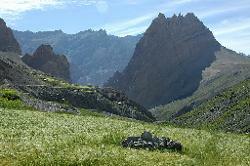 The picturesque village of Photoskar clings to a barren slope at the foot of sheer cliffs. 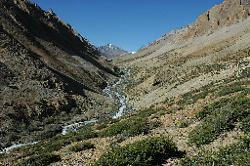 Irrigation channels bring the precious water from high up to the barley fields and make survival possible. 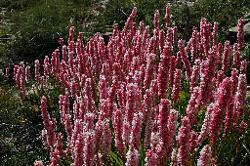 Afternoon sun increases the stunning colours and contrasts even more. 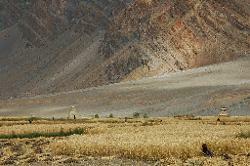 Wide barley fields contrast with the barren rockfaces. 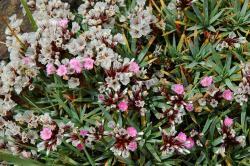 Near the river stands the traditional mill; the dusty miller is very friendly. 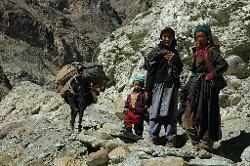 Women on their way home from the main village. 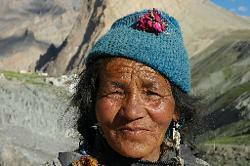 Smiles and smalltalk with local women. 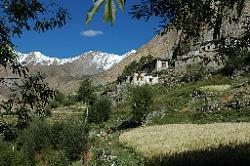 Whitewashed houses appear in the green barley fields; but the main village stands at the end of the valley. 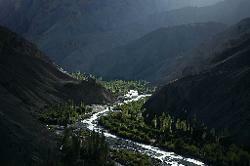 Tranquil evening in Ladakh; the fertile valley against the backlight of the setting sun. Altarlike mani wall in the middle of a barley field. ...and then laid out to dry in the sun. 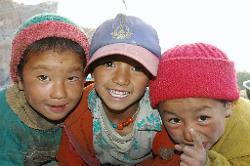 Baby transport the Ladakhi way. 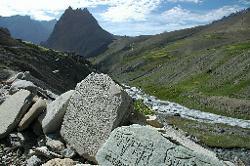 Mani stones ahead of Photaskar with Bumiktse La and Singe Peak in the background; our destination for today. 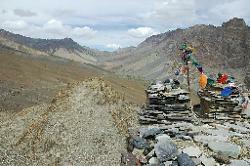 On top of Bumiktse La; an easy pass that crosses a low ridge. 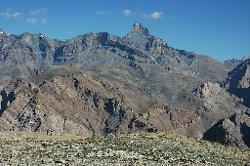 Sirsir La; the pass of yesterday; at the horizon. 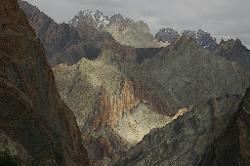 The weather does get worse; and the rainy afternoon is best spent in the tent with views of Singe Peak and its glaciers. 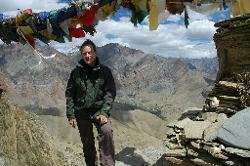 Climbing the high Singe La pass is not rewarded by good views; nevertheless our crew enjoys the rest. 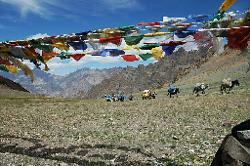 Horse caravan descends from Singe La towards Zanskar where the weather looks better. 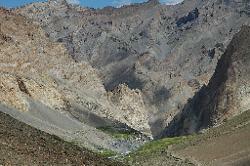 Far down must be the arid Zanskar gorge; but todays camp at Yulchung appears as green spots in the arid landscape. 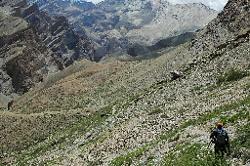 After some narrow and tricky parts of the trail our caravan stops fora short rest on a little plateau. 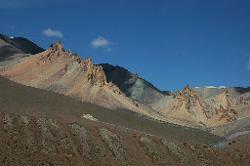 Jagged craggy hills in stunning colours make for an interesting walk. 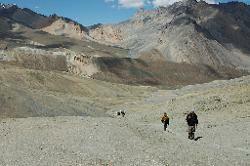 The trail traverses the slope above Yulchung. 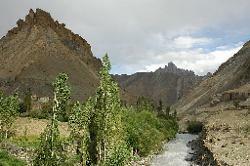 Yulchung is a small but stunning village that sees only few visitors. 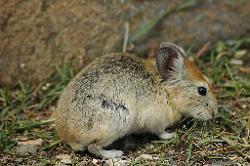 ... thanks to their fun-loving and friendly inhabitants. Kids are well-behaved; and lose their initial shyness after awhile. 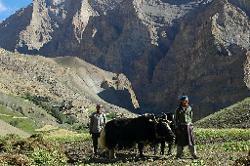 Fields are ploughed with yaks; teenagers return from their school in summer to help out in their village. 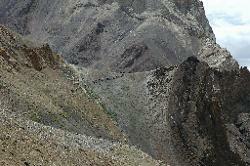 Horses following us on the way to Nierak; Singe La crosses the ridge at the horizon . 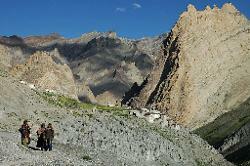 On the way to the bridge that crosses the Zanskar river below Nyerak; our camp for tonight. 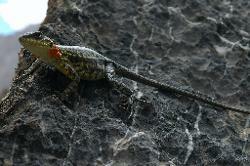 Orangespotted lizard resting on the hot rocks. ... and the refreshing bath in a cold pond is a gift from heaven. 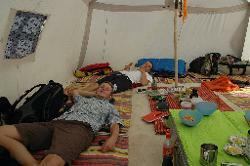 ... and more relaxing in the dining tent in luxury and style. 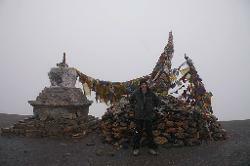 What a contrast to my previous and next trek in Sikkim where it was cold and tough but also enjoyable. 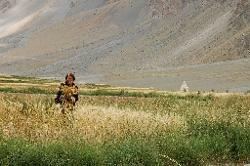 Woman with her baby in Nyerak; during most of the afternoon she worked in the pea fields with her other son. 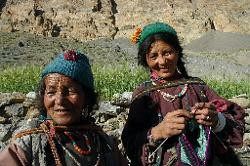 Elder women return with goats from the meadows; the animals have to spend the night in the village because there are plenty of predators around at night. 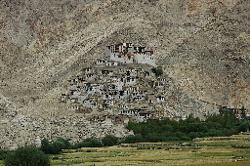 The monastery of Nyerak is simple but effective. 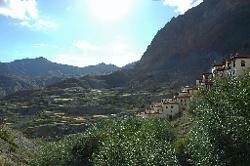 From the veranda of the monastery we look over the village and its fields. 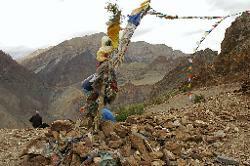 In the background on the opposite hillside lies the path to Cho Cho Guru La and Singe La; both passes catching the last rays of the sun. 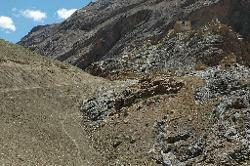 Climbing up to Takti La, a very tiring 1300 m climb with Singe Peak in our backs. 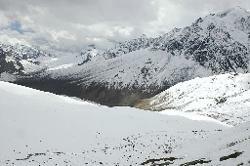 After long and neverending hours and some false passes we finally do reach the real pass of Takti La; and relax despite the cold wind. 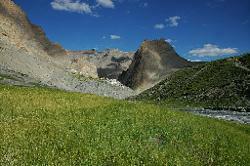 In the background are Singe Peak and the pass to the right. 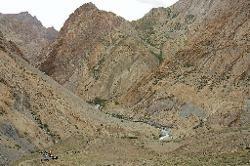 The horses arrive at the Takti La pass shortly after us; get their loads fastened and continue down the other side. 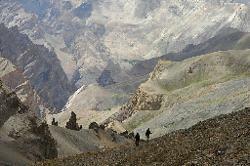 Before losing altitude for good; another ridge has to be crossed before we get to enjoy an hours walk of fairly level ground. 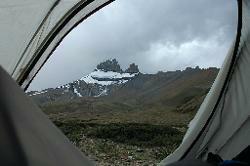 After an hour in the valley we finally see campsite at the foot of rock towers. 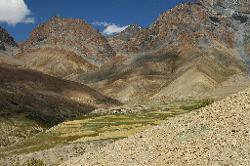 We're in a remote valley;even for Ladakhi standards; and light fires during the night to keep away potential bears. 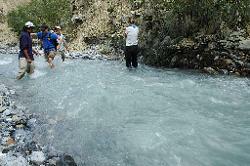 Taking off shoes and walking in the creek; a different kind of trail. 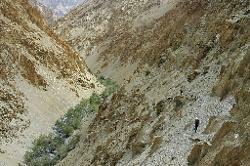 We climb out of the narrow valley on a steep and narrow trail. 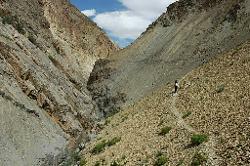 One more traverse through a steep slope where slipping not advised. 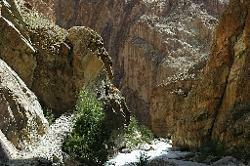 The creek has eaten its way into the rock and roars below us. 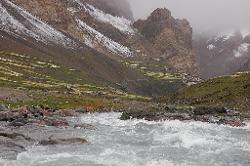 The river is not deep; but the fast-flowing icy water does require some care when crossing it barefoot. 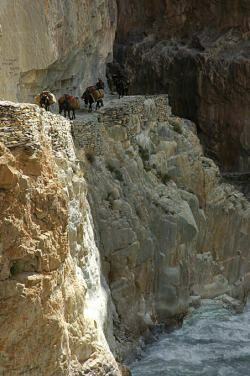 A narrow trail with interesting bridges that span over chasm need to be crossed; once more I am surprised about the agility of our horses. 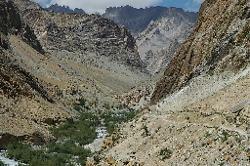 Leaving the uninhabited valleys behind; we slowly reach higher and wider spaces on the way to Zangla. 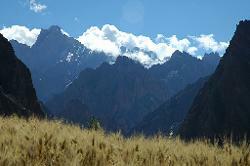 A gentle climb takes us to Namtse La; far away at the horizon rises Singe Peak as a black pyramid . 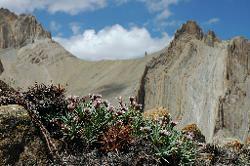 After having crossed the Top of the Sky pass; Namtse La; we are descending towards the Zanskar plain in a steep and narrow valley of red and black rock. 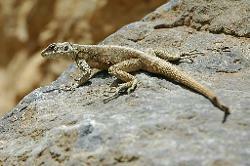 Lizards relax on the hot rocks. 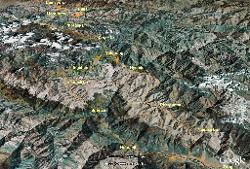 The wide valley near Zangla is a strange sight; the first flat area since many days. 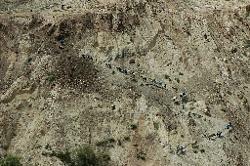 The horse caravan passed us and is setting up camp around the river bend. 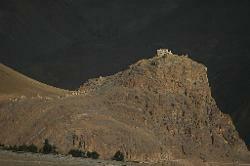 Sunset illuminates the ancient fortress of Zangla that stands above the village and guards the entry to the Jumlam; a complicated way to get to Leh that passes Basgo and was used by Dogra invaders in the past. 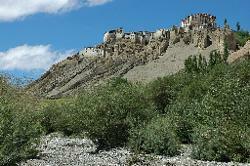 Impressive and strategic location of the fort; but easy enough to reach by foot. 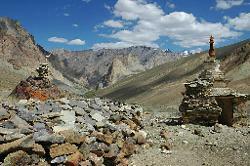 Countless chortens and maniwalls indicate the way to the fort; indicating the importance of the palace in past times. 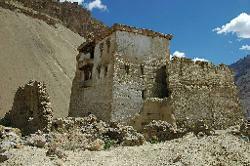 The fort of Zangla was home to one of the first Western tibetologists in history; now rain has damaged the building and it is often locked. 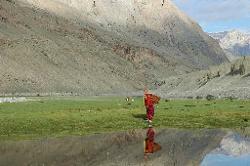 The nuns at the Changchub Choling nunnery just outside the village are very friendly and invite us for tea during their morning ceremony. 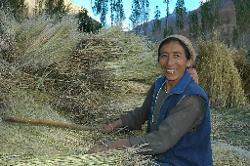 Unlike monks; nuns have to spend much time working in the fields; or collecting fuel for the winter. 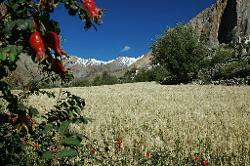 We head back north into Ladakh; after crossing the Zanskar river we pass through barley on the wide fields of Pishu. 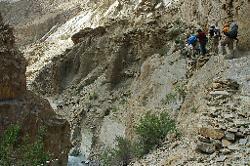 The stretch betwen Hanumil and Snertse along the Zanskar river is one of the less interesting parts of the trek; but it does not take long and we are on the way to the next pass; the Parfi La. 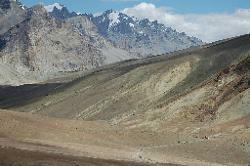 After a little climb we have left the Zanskar river behind and are on top of Parfi La: with good views to the next climb ahead of us. 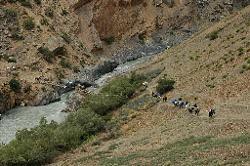 We cross the rickety bridge near the shepherd hut; and climb up to reach our campsite. 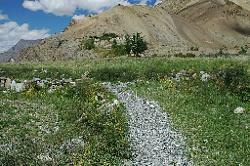 Parfi La is reached by the zigzag trail in the background; I am glad we came down and do not have to go up. 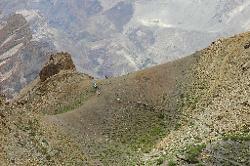 Another slope with a narrow trail; Parfi La in the back. 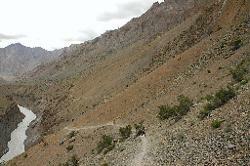 Turning around while climbing up to Hanumil La reveals a chasm and part of yesterday walk. 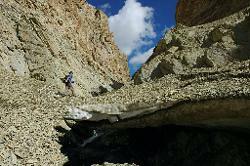 The icebridge is covered by rubble and dripping heavily in the hot sun; but probably more stable than some of the manmade bridges in the area. 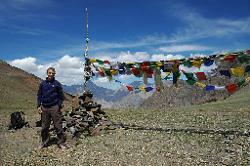 Welldeserved ego picture on top of the pass; it was a three hour walk to the pass and good to rest for some minutes. 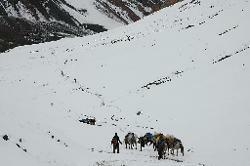 While we rest on the pass; horses come up from Lingshed on their way to Padum. 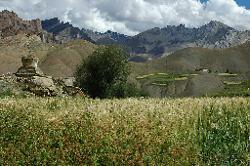 Lingshed is a lovely village with many houses and even more barley fields. 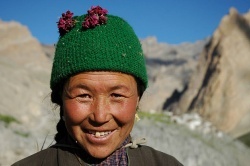 People are happy to take a break from working in the fields and sit down for a chat. 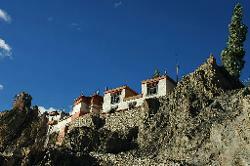 The monastery of Lingshed stands a little above the village; just below the steep hillsides that tower above it. Late afternoon in Lingshed with the monastery and the fields in the background. 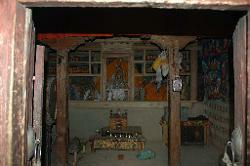 In the evening a novice blows the horn to announce the puja. 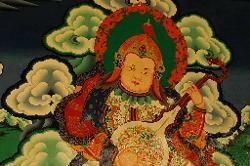 The monastery features fine mural paintings and old statues. 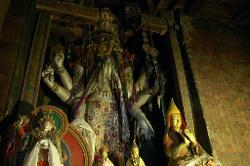 Palden Lhamo; protector deity of Tibet; is depicted on the wall of a new hall that contains nice statues. 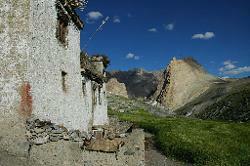 Lonely hamlet of Gongma on the way to our next pass. 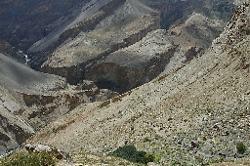 After a steep climb the last few meters to the top of Kiupa La are easier and let us marvel at the landscape that surrounds us. 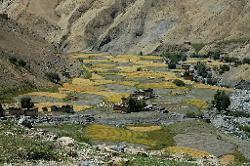 On the way to our camp at the foot of Singe La; some houses of Yulchung appear at the bottom of the valley. 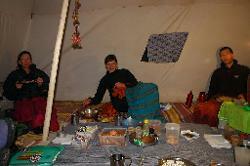 Enjoying snacks before dinner; with a large selection of teas; biscuits; popcorn and sauces. 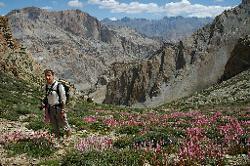 Yes; trekking can be luxurious at times. 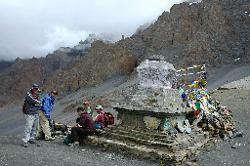 The weather deteriorates for the next two days; we make it to Singe La pass before snow covers the ground. 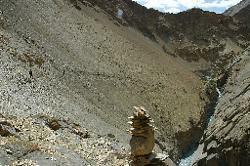 Some hours later it lies so high that a group of Japanese tourists on horses are not able to cross. 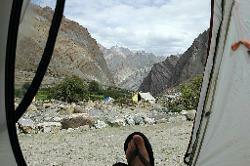 I only leave the tent for short intervals during our enforced restday. Chorten above Photoskar during a foggy; rainy and snowy afternoon. 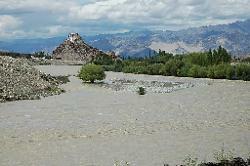 The river has swollen the last two days; and gushes past our campsite towards the village. 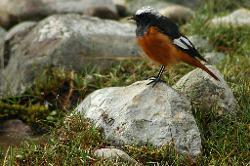 The rain must have driven worms out of the ground; a large variety of birds appeared and hop around our campsite. 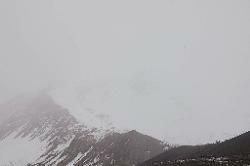 Snow has melted very quickly; only the steep mountain flanks above Photaskar are covered. 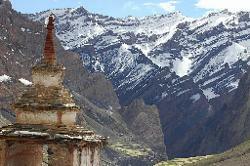 From the chorten the views of Photaskar are as stunning as during our walk in; and the snow gives it a difference atmosphere. 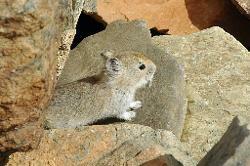 Pika are usually very shy; after two days of rain and snow they are quite careless and enjoy the sun; leaving their nests inside the mani wall. ... I suddenly realize something is tugging at my pants. 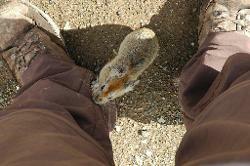 The layer of snow must have made the pikas really really hungry. 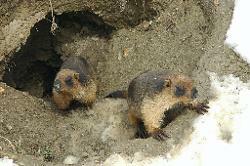 Marmots are also out of their holes and look for food. 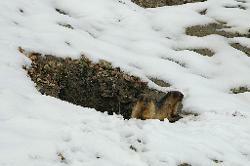 ... but soon come out of their hole again and do not seem to be bothered by my presence. 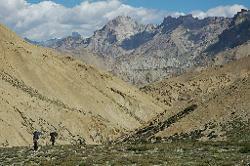 Our kitchen crew follows on the way to Sirsir La. 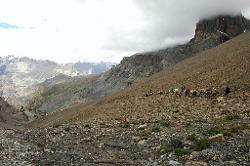 Horses catch up on the trail that goes through the fairytale landscape. 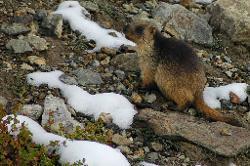 ... and follow the others on the way to Honupatta. 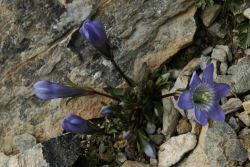 Abruptly the snow stops; and alpine flowers grow out of the rock. When the village and its field come in sight we put up camp beside the river. Another spectacular sunset in Ladahk. 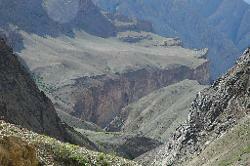 We'll soon walk through the gorges at the foot of the jagged cliffs. One of the few people we meet on the trail; this family is on their way to their house in Honupatta. 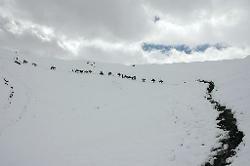 We planned a different route; but bad weather forced us to change them and now we are returning to Panjila and then walk from there to Lamayuru. 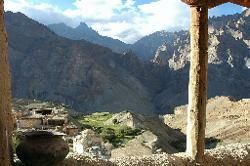 Wanla is a large village; from its monastery we watch a sidevalley retreat into darkness as the sun sets. 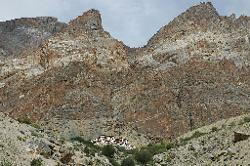 The monastery high above the village is striking; both its location and interior. 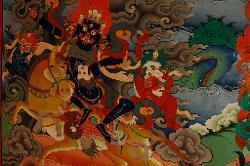 Mural paintings and old statues are worth the visit of the gompa which is almost a thousand years old. 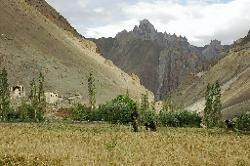 People at Wanla are busy harvesting; most of the barley fields are done and people are taking care of their gardens or collecting mustards seeds. 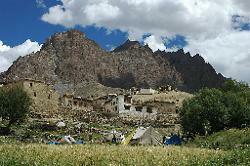 The famous monastery of Lamayuru indicates the end of our trek. 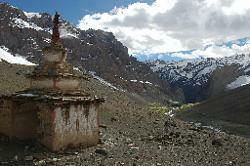 As usual; the gompa overlooks the fertile valley and the village. 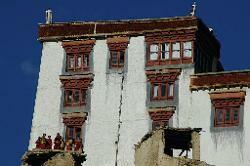 Many young monks study at the monastic school; and enjoy the break in the afternoon. 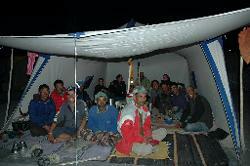 Group picture at end of trek; the horsemen; kitchencrew; and tourists in the back of the dining tent.